Water Heater Repair Everett WA Can Depend On! When you call Plumbing Experts NW, you get decades of experience of service to water heater repairs in Everett WA and surrounding areas. Experience makes all the difference when approaching a leaky hot water heater, and trying to discern if there's something loose or malfunctioning, OR if the tank is rusted-out and needs to be replaced. One thing is for sure, most families in the Everett area won't be able to go without running hot water for long. 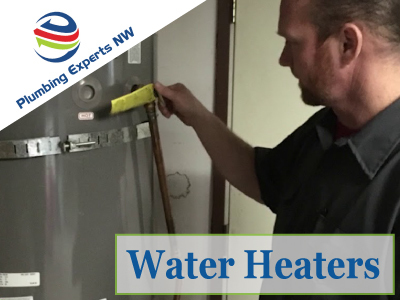 Allow our staff to take your call and get to your emergency water heater repaired fast, and you can call on us 24 hours a day at 425-948-7705. Plumbing Experts NW is locally owned and family operated, so we deliver expertise with a little more personable touch. Water Heater leaks are annoying for sure, but you can get a trusted advisor and experienced workmanship on your side, in the case that disaster strikes. If there's any sign of water on the ground around your water heater, don't hesitate, just call us. We're here for you, and we want to be your plumbing and water heater repair company in Everett and surrounding areas. You can depend on us! Call 425-948-7705. We do the water heater repair in Everett and surrounding areas. We also have tankless options!